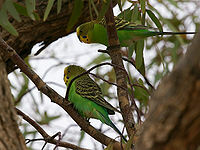 The budgerigar (Melopsittacus undulates) is a small Australian parrot. Originally, in its native habitat - the great semi-arid plains of the inland with its nomadic existence dictated by the availability of water and seed – its plumage was monotypically yellow and green, barred with grey-brown to black down back and wings. Modern breeding has introduced blue to the mix. The bird is 170-200mm long, about half of which is tail. Its contact call is a melodic warble. Like many parrots it also has a rasping screech when inclined and an incessant chatter when congregating in numbers. Quite often, they are heard before they are seen when resting in trees along a water course. It is a social bird and appears in great numbers where there is feed. Like some other Australian wildlife they breed when the conditions are favourable rather than sticking to the seasons. In “normal” years, birds in the south of the continent nest in August to January (spring to early summer); further north, June–September (winter to early spring). Other names: shell parrot, love bird, warbling grass parakeet, zebra parrot, canary parrot and various variations on the spelling of budgerigar. The humble “budgie” is Australia’s avian gift to the world. It is the best known parrot and, with the canary, the most loved cage-bird in the world. Its advantage over the canary is that it comes with the capacity to recite its own name and telephone number so that it can be returned to its rightful owner if it “escapes”.